I finally did what everyone else has been doing for the past couple of weeks. 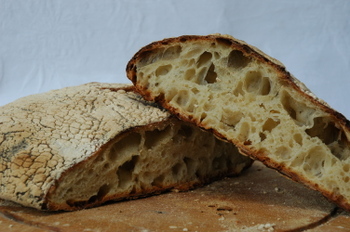 This is my no knead bread as featured in the New York Times made by Jim Lahey. I'm not sure where I went wrong but I waited 40 hours for it to rise and the bubbles to form on the surface. Even then there were only two bubbles but as the surface was beginning to turn grey I went ahead with the next step. When it was all nicely laid out on the cloth for the second rising I went out to lunch. There was just enough time , it was a long lunch, to bake it ready for dinner. So it didn't rise very much and it's a but too crunchy on the edges but it tasted sensational. The family loved it and we ate the lot with dinner tonight.